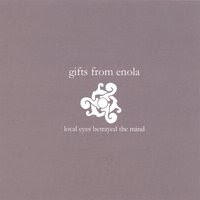 Gifts From Enola, a four piece from Virginia in the United States, are a really refreshing band. You can see this from their MySpace (at the time of this review they have no website). There’s no fancy layout, no flash images, no HTML, just the music and a little bit of dialogue. They’ve let their music do the talking, and what a good idea that turns out to be. It’s heavier than your average post-rock, very much metal inspired, and for Gifts From Enola, the standard quiet-loud dynamic seems to have changed into a loud-even louder dynamic. This is a good thing. With no website to feast my journalistic eyes upon, I’m left with a very sparse MySpace to inform myself about the band. Well…a couple of them are 20, the others two are 19, something that is incredible given the music they make, and it can be safe to say that Gifts From Enola might not go down too well in Japan. The Enola Gay was the name of the plane that brought gifts to Japan in the form of atomic bombs. This might all be a mighty coincidence, but Gifts From Enola have a picture depicting something similar to this on one of their show flyers. Anyway, I’m sure the band isn’t praising this, and for the record, I like the name. Loyal Eyes Betrayed The Mind opens with "Behind Curtains Closing," which starts with a lulling guitar before exploding into a crashing riff, not a million miles away from "Greet Death" by Explosions in the Sky, before, at 3 minutes and 23 seconds, something magical happens. Out of seemingly nowhere, this fast, heavy, and complicated guitar riff appears, changing the whole tempo and feel of song, taking it on to the next level. Gifs From Enola have certainly followed the old cliché "put your best foot forward," unleashing the best song on the album first. But the rest of the album is in no way a let down, it just highlights how strong the opening track is. "Early Morning Ambulance" follows on nicely, with heavy riffage added with a high pitched guitar, before it all comes to a crashing rhythmical finale, and sounds not dissimilar to Russian Circles. "City Lights Scraped The Sky" contains one of the best breakdowns you’re likely to hear, with two guitars duelling with each other to create a gorgeous little melody, before exploding into some more heavy riffage. "In The Company Of Others" kicks off with some jazz inspired bass line, and then becomes even more frantic with the introduction of a distortion pedal and guitar tapping solos.